Compete ran some numbers last month on the average income levels for each of the top 6 social networking sites in the US. They examined Pinterest, LinkedIn, Facebook, Twitter, Tumblr, and Google+. LinkedIn of course has a larger percentage of high income wage earners than most social networks. But if the numbers below are correct, Google+ has an even more affluent user base than LinkedIn. Google+ has the highest percentage of it’s user base from those making $100k and above. LinkedIn counts 27 percent of their social network from this same group. Google+ also counts the lowest percentage of their user base from those making under $30k. Less than LinkedIn for the same group at 21 Percent. Tumblr looks to be the least affluent social network, with 60 percent of its user base making less than $60k. This lower income rates for Tumblr users can be attributed to the younger demographic of the site. 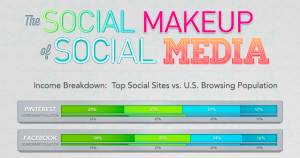 LinkedIn and Google+, likewise, have two of the older demographics among the most popular social networks. View a larger version of the infographic here. 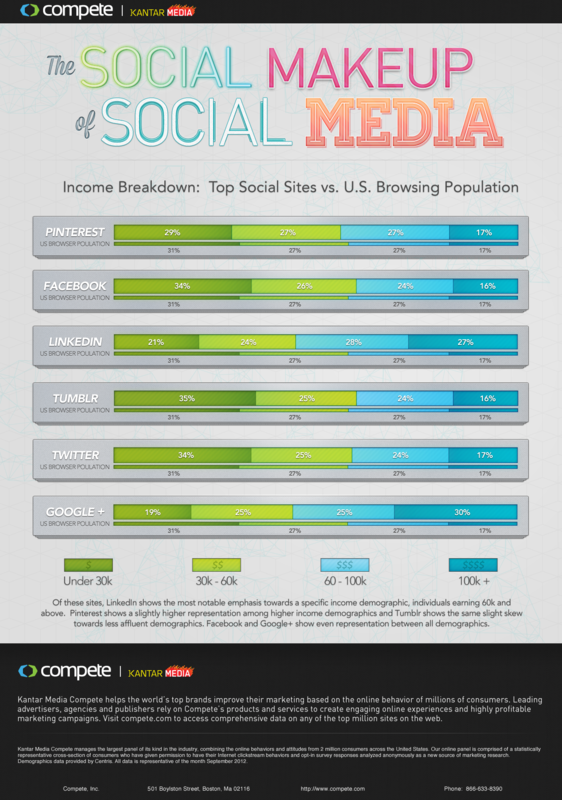 Editor’s note: The Compete infographic claims that LinkedIn has the “most notable emphasis towards a specific income demographic.” This does not seem to prove out in the actual percentage numbers of the chart, with Google+ having 30% in the $100k column and Tumblr holding 35% in the <$30k column. Please also note that the Google+ breakdown is missing 1%.